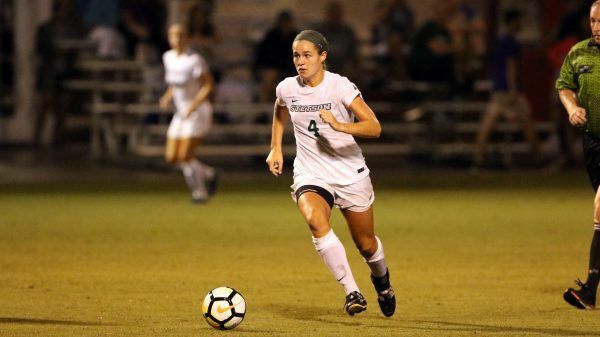 The Stetson University Hatters Women’s Soccer Prospect ID Camp is a two-day event that will fall on July 28 and July 29. Its daily schedule is set to start at 9 o’clock in the morning and end at 4 o’clock in the afternoon. Moreover, this soccer identification camp is open to all female soccer players 13 to 21 years of age who are looking to experience a college level training and playing atmosphere. The program is only offering 60 available spaces for field players and 8 available spots for goalkeepers. This registration is on a first come first served basis. In addition, this elite soccer camp is going to take place at Stetson University’s state of the art Athletic Training Center. Stetson University, formerly DeLand Academy, is a private, nonprofit university. Its founder is New York philanthropist Henry Addison DeLand. The school has a 175-acre campus in DeLand, Florida. The DeLand campus is on the National Register of Historic Places. Currently, Stetson has a total undergraduate enrollment of 3,089. The gender distribution is 42 percent male students and 58 percent female students. This undergraduate student population is also through a selective enrollment acceptance rate of 66 percent. Correspondingly, Stetson University’s student to faculty ratio is 13:1. There are more than 60 majors and minors offered as well as Master’s degree and dual degree programs. Stetson has 195 full-time faculty teaching undergraduate courses. 95% of those faculty are holding Ph.D. or equal degrees. Stetson’s mission is to provide a creative community where learning and values meet. The institution also has the dedication to help students move from success to significance. Furthermore, Stetson has approximately 20 honorary academic and professional organizations and over 100 other student organizations on campus. It is a member of the Southern Association of Colleges and Schools. In sports, Stetson University fields it’s men’s and women’s varsity teams in the Atlantic Sun Conference of the National Collegiate Athletic Association Division I. They are the Hatters and their identity colors are green and white. The head coach of the Stetson University Hatters women’s soccer team is Manoj Khettry. He is now entering his sixth year at the helm of the Hatters women’s soccer program. Coach Manoj Khettry is an alumnus of Earlham College. He earned his master’s degree in Spanish Language and Literature at Miami University of Ohio. Coach Manoj Khettry is a United States Soccer Federation (USSF) “A” coaching license and an NSCAA Advanced National Diploma holder. Ultimate, Coach Khettry is the 2008 Atlantic-10 Conference Coach of the Year awardee. This award comes after he led the St. Bonaventure University women’s soccer team to an Atlantic 10 Tournament berth. Then, the Stetson University Hatters women’s soccer assistant coach is Jordan Calabria. Coach Jordan Calabria is in her first year with the Hatters women’s soccer coaching staff. She is a bachelor’s degree graduate from St. Bonaventure University. She is a former Moon Area High School and St. Bonaventure standout player. In fact, she was instrumental in Moon Area High School’s two Western Pennsylvania Interscholastic Athletic League titles. Coach Calabria was also a four-year letter winner at St. Bonaventure and was part of their impressive Atlantic 10 run. Coma and join the Stetson University Hatters Women's Soccer Prospect ID Camp on July 28 and July 29. This program is intended for all girls who are aspiring to become a college soccer student-athlete. The camp will cover both the technical and tactical aspects of the game. There will also be competitive 7v7 and 11v11 matches, and a college recruiting seminar.